Red Dead Redemption's Liars and Cheats DLC is due out next week, bringing with it the brand new Stronghold game type, and this is what it looks like. You can never have enough flags in online multiplayer games; that's what I always say. 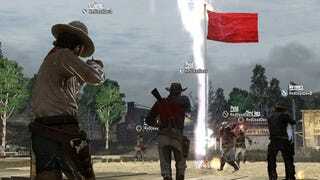 Red Dead's new Stronghold multiplayer mode increases the number of flags in Rockstar's cowboy game by two, and that's definitely more flags than there were previously, so I'm all for it. I know with my skill level I will never get close to either one, but it's still nice to know they're there. Liars and Cheats will be available for purchase on September 21.